A few days ago I had lunch with a friend who is very involved in the refugee crisis, since she works with the European official in charge. They had come to Greece in order to meet with various members of the Greek government and to visit Lesvos (they had previously stopped by Lampedusa). The things she told me make for scary reading. Refugees must go to the nearest hot spot to be fingerprinted and given identity papers; then they will have to wait until they are sent to the country they are allocated to. This might take months, given the numbers involved and the usual bureaucratic delays. So why would they want to do that when – by other means – they can be in the country of their choice in four days? Nobody wants to stay – and almost nobody stays. It also appears they have to be persuaded, rather than told, to have their fingerprints taken. It’s their choice – whereas all Greek are obliged to be fingerprinted for their identity cards. A few days ago I read in the papers that – so far – only 15 Syrians have elected to stay. But if people are undocumented, it is very difficult to implement any kind of coherent policy for dealing with them. Secondly, desperate people do desperate things. There are more and more babies and children coming in, because parents with children get automatic priority. There are more and more unaccompanied minors, sent by families hoping they’re going to a better, safer life. But I don’t need to point out the dangers they face traveling alone, and who knows how many don’t make it – and how many are abused and exploited along the way? Worst of all, people have started to steal kids because they can use them to get preferential treatment. When they arrive at their destination, they dump them. More money is now being spent on a campaign to try and locate their families. Only in the last two months, more than 100 children have drowned in the Aegean Sea, while in the last couple of days, 31 kids lost their lives in 7 separate shipwrecks. 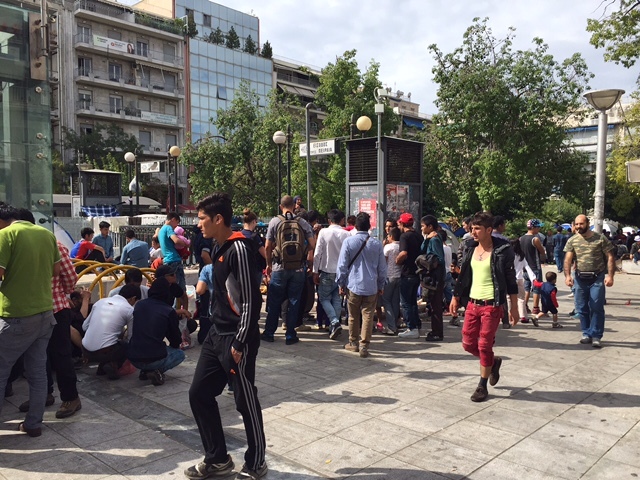 The mayor of Lesvos has asked that identification of the refugees is done in Turkey, to avoid so many drownings. Meanwhile, the local morgue is full of bodies and there is need for a new burial ground. And for the ultimate irony: an airplane ticket from Turkey to Germany costs around €400. These people are paying well above €1000 to cross over on a floating death trap. Surely there is a moral in this somewhere. Something else I didn’t know, and which I found quite shocking, is that sending people back home is often not possible, because their own countries WON’T TAKE THEM BACK (I’m not talking about war-torn zones like Syria here.) They prefer their citizens to stay abroad, since that means a lot of foreign currency will be coming in, and it also helps with local unemployment. It seems every measure taken has a huge downside. The more people are saved, the more come over. In October alone, 218.00 people have crossed the Mediterranean, and of those, 210.000 have ended up in Greece. We are witnessing the biggest movement in populations in the history of mankind. 60 million people, from Syria and Afghanistan, Gaza, Iraq, Haiti and a dozen African countries have fled endless wars and disastrous governments. And it’s not over yet. The wars are far from ended, ISIS and the Taliban are still preying upon entire populations, religious minorities are being hounded from their homes. The floods and droughts brought on by climate change exacerbate the problem. It would only take one typhoon in the Bay of Bengal to displace millions in Bangladesh. In the next few years, immigration from Africa is set to increase exponentially. Many of the young African countries are doubling their population every twenty years. Most of their current population is under 30 years old, while their governments are not doing much in terms of job creation and services. We’re talking billions here, a large number of whom will want to come over. Recent studies have shown that in developing countries, more than half wish to move to the west. All this is bound to lead to a rise of the extreme right in European countries, something which has already started. Tensions are growing – the refugees are at the end of their tether, but so are a lot of the people assisting them, who sometimes feel they are not grateful enough for the help they’re getting. Many are demanding that borders be secured. The Schengen concept is in real danger, even though Angela Merkel is warning that border closures and fences to stop refugees “could cause military conflict” in the Balkans. The face of the world is changing, and most of us have yet to realize it. I’m sorry to keep harping on about this subject. In spite of everything, some people remain optimistic that the refugees can eventually be absorbed by EE countries. Today, I read that 30 refugees were flown to Luxemberg for resettlement – a drop in the ocean, but still, some kind of start. Others just do their best to help, like Britons Andrew Davies and Wendy Wilcox, who set up Solidarity Symi on the island of Symi, to help the people coming through. I also heard that young men on the islands are going out on jet skis, braving huge waves, to rescue people from shipwrecks. 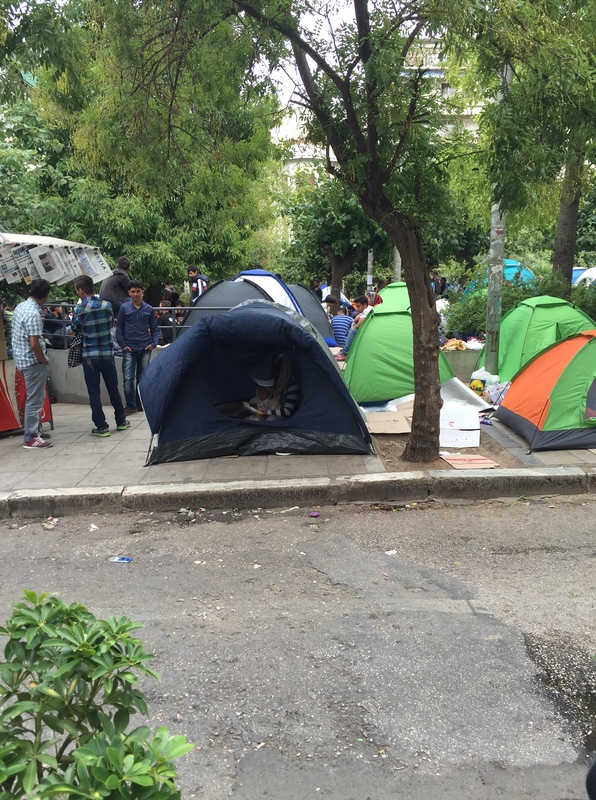 Meanwhile, winter is approaching, and the refugees will have to face weather a lot of them are not used to, in many cases being obliged to live outdoors. Some parents are already wrapping their kids in rubbish bags to keep them dry…The seas are getting rougher and more dangerous, but the flow is not lessening. It is possible that because of all the talk of frontiers closing, many people feel it’s now or never. Thank you for sharing above information. Wishing the best to happen….. What is the best?… Can we know it? Are we ready to do always our best? Are we ready always to focus on what is really matter? How much have we discovered how life really works? Please do keep harping on this ! The inability of the EU countries (or unwillingness) to deal with the situation early on is taking a huge toll everywhere and it seems it will only get worse. Feels like even bigger problems ahead. Some ‘experts’ believe the migration crisis now, is just the tip of the iceberg and everyone needs to get prepared for a complete change in countries’ sovereignety and demographics. it sounds very possible ?? You certainly don’t need to apologize for talking about something this important! Only when enough people are outraged will the situation change. Eloquently written, too.